In November, PHE published the second annual ESPAUR report describing the surveillance of antibiotic resistance and antibiotic use in England. The report brings together three crucial data sets, some of which weren’t previously in the public domain: antibiotic prescribing in the community, antibiotic prescribing in hospitals and levels of resistance to antibiotics in common bacteria that cause infections. 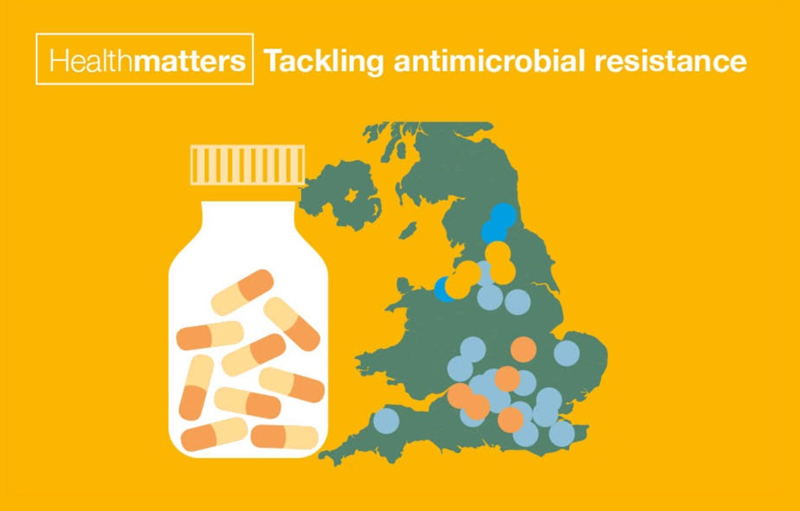 In this Health Matters blog, Healthcare Epidemiologist Dr Susan Hopkins answers key questions about what the report tells us and the challenge we face from antimicrobial resistance. Publishing GP and hospital prescribing data and analysing antibiotic prescribing trends is part of PHE’s responsibility, outlined in the cross-government antimicrobial resistance strategy, but ultimately we see the work as part of the solution to this very worrying problem. ESPAUR is about collecting and publishing data which describes the actual situation on the ground, which can then be used to inform or change practice. Countries like Denmark and Sweden have used surveillance programmes like this for nearly 20 years, and have the lowest use of antibiotics as well as the lowest rates of antibiotic resistance. We also have to aim to become one of the low antibiotic use countries in Europe, which will help to slow down or possibly even reverse the increase in antibiotic resistance. What are the key findings from the latest report? 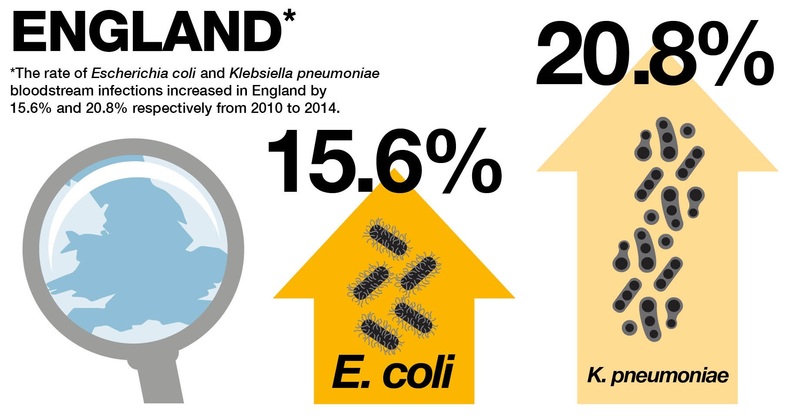 We collect a wide range of data but my main concern is that we’ve seen rates of bloodstream infections caused by Escherichia coli and Klebsiella pneumoniae increase by 15.6% and 20.8% respectively, from 2010 to 2014. These two bacteria cause the greatest burden of antibiotic resistant infections in England. In terms of prescribing, although the number of prescriptions issued has decreased, when measuring total antibiotic consumption in primary care there has been an increase of 6.5% between 2011 and 2014, with 2.4% of the increase occurring between 2013 and 2014. This suggests that longer courses and higher doses of antibiotics are being prescribed in general practice. Antibiotic prescribing to hospital inpatients increased significantly by 11.7% and to hospital outpatients by 8.5% between 2011 and 2014. And with the exception of general dental practice, antibiotic prescribing increased across the NHS in 2014, which is not the direction we want things to move in as we would like to return to the levels of antibiotic prescribing we had in 2010, or even lower if we consider it safe to do so with careful monitoring. We believe achieving this target is feasible within the timeframe of the current 5-year strategy, without negative consequences to the nation’s health and well-being. Who must take action – some say doctors, some say patients asking for antibiotics are the main issue? A blame game will not solve the problem of antibiotic resistance. GPs, for instance, prescribe the most antibiotics because they see the vast majority of patients and when we speak to GPs we find they are dedicated to their patients but also recognise that we are facing an antibiotic resistance crisis. We believe prescribing can be reduced through developing the right interventions rather than sanctions or a ‘them and us’ mentality. The view has to be the same with the public. Rather than lecturing people we have to keep making the case - through campaigns and working with the media - that antibiotics aren't the solution to all our health problems. In fact, taking them when they aren't needed can harm both the individual themselves as well as damage the overall effectiveness of these precious medicines. The first ESPAUR report was published last year – are the warnings not working if prescribing is still on the increase? Reducing prescribing is a long journey and it will take time before the effects of our various interventions are reflected in surveillance data, but crucially the data will ensure we are informed where action is needed. In 2016, we will start to present data on healthcare associated infections, antibiotic prescribing and resistance online through PHE’s Public Health Profiles. This will enable transparent data to be viewed by healthcare professionals and the public in one place, supporting healthcare providers to develop local action plans in their organisations. There is a lot of work taking place to tackle antibiotic resistance and reducing prescriptions of antibiotics is just one strand of that work. We must not underestimate how much effort is still needed to turn the tide of antibiotic resistance. Is there any positive news from ESPAUR? The report shows that the number of prescriptions dispensed in primary care has declined for the second year in a row. Use of broad spectrum antibiotics (antibiotics that are effective against a wide range of bacteria and more likely to drive antibiotic resistance) has decreased in primary care. This decrease now means that England is the lowest prescriber of some of these drugs in the European Union. We may now have good data but what are we going to do with it? What initiatives are in place? It’s very important that both GP surgeries and hospitals put action plans in place to reduce prescribing and the tools and guidance to do this are discussed in a separate Health Matters blog. We also need to keep improving the quality and granularity of our prescribing data so that our analysis becomes increasingly meaningful to prescribers and commissioners. 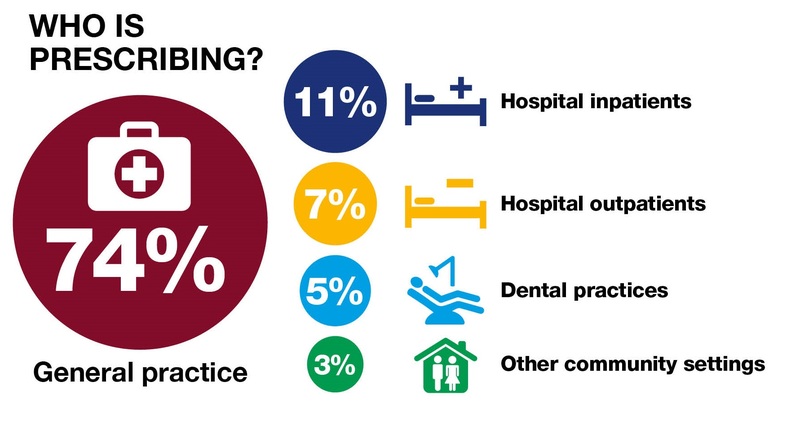 We’re working with NHS Business Services Authority and HSCIC to develop a practice code for dentists and also to record dental prescribing to individual practitioner level, so that within practices they can review individual practitioner prescribing. Openprescribing.net has recently been launched to enable health professionals, patients and the public to easily explore patterns of prescribing nationally, in Clinical Commissioning Groups and by individual GP practices. It uses raw data on GP practice prescribing from the Health and Social Care Information Centre and can be used to see who is prescribing. And education remains crucial. We’re linking up with Health Education England to develop methods to embed antimicrobial prescribing competencies within the curricula of all healthcare professionals and we’re working with a range of professional organisations to ensure that there are training opportunities available. For example the British Society for Antimicrobial Chemotherapy, have released an antimicrobial stewardship MOOC (massive open online course), with contributions from PHE staff, and thousands of people have registered and participated in the first course; with three further courses planned in the next year. Our Behavioural Insights team have performed a randomised controlled trial last autumn to assess the impact of a letter from the Chief Medical Officer informing GPs about their prescribing practice in comparison to their peers. Early results look encouraging but the final results to demonstrate whether this has a long lasting impact will be available shortly. We have also worked with NHS England to develop an antibiotic prescribing quality premium to assist GPs and commissioners to focus on reducing antibiotic prescriptions. And finally we’ve again run a successful Antibiotic Guardian campaign encouraging both health professionals and the public to make a pledge and carry out one simple action that can help save these precious medicines.